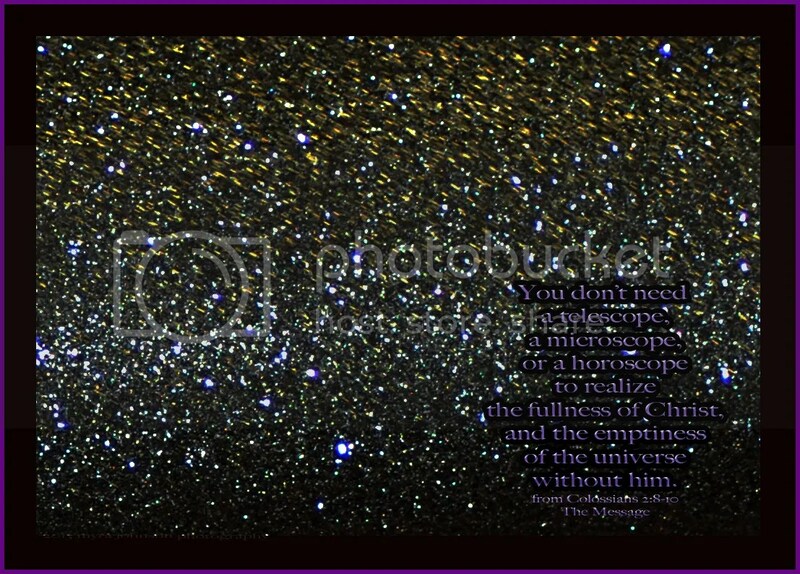 The emptiness of the universe. When I look into the sky, my limited eyes see the glowing dots of white, forming patterns here and there. If I look at a photograph from a telescope, I see much more. Countless stars on a blanket of darkness or the swirling colors of a nebula. But what if they all ceased to exist? As difficult to fathom as existence is, non-existence cannot be comprehended. Without the fullness of Christ, would it not be that way? Without Christ, would we not be empty, as well? Watch out for people who try to dazzle you with big words and intellectual double-talk. They want to drag you off into endless arguments that never amount to anything. They spread their ideas through the empty traditions of human beings and the empty superstitions of spirit beings. But that’s not the way of Christ. Everything of God gets expressed in him, so you can see and hear him clearly. You don’t need a telescope, a microscope, or a horoscope to realize the fullness of Christ, and the emptiness of the universe without him. When you come to him, that fullness comes together for you, too. His power extends over everything. Having glanced over to my right, I noticed that a rain cloud had burst into a downpour over a nearby lake.